WMI (Windows Management Instrumentation) is a way of obtaining information from your PC that otherwise might be hard to find. WMI is based on Common Information Model (CIM), so you’ll see an example of that too. There is one drawback: for a lot of the WMI, you need to have enough privileges (like: being an admin, which none of you should be, right?). You can use WMI from C#, but you have to generate the C# classes for the WMI classes first. I’ll show some examples for WMI Win32 classes, as I needed some of those classes recently myself. in order to browse through the WMI Win32 object instances, you can download this nifty WMI Administrative Tools toolset from the Microsoft MSDN site. Note that these are from 2002, and they only reliably work from within Internet Explorer. Start with creating the C# project where you want to have your classes in. Then generate the C# classes. Add these C# classes to the C# project. So lets go into the C# file generation a bit deeper. There is a little tool called <code>MgmtClassGen.exe</code> for that. 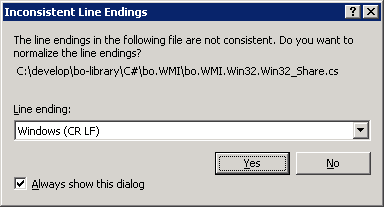 However, that tool generates your C# files with the name space ROOT.CIMV2 and name them after the WMI class, but for Win32_ prefixed WMI classes, it stripts the Win32_ portion from the filename and to top it up: uses .CS as extension (in stead of .cs). So… I wrote a little batch-file that generates the C# files the way I want it: using bo.WMI as the base namespace, bo.WMI. as the filename prefix and .cs as the C# filename extension. Add a reference to the System.Management.dll assembly (since WMI needs the System.Management namespace). And finally you will probably want to fix the line-endings, as the generated C# files do not have consistent line endings. So don’t be surprised if you see a dialog popping up like the image on the right. WMI is based on classes, that provide access to instances of WMI object. I hope this gives you some inspiration on how to use WMI to your advantage. This entry was posted on 2009/04/25 at 14:20	and is filed under .NET, C#, Development, Software Development, Visual Studio and tools. You can follow any responses to this entry through the RSS 2.0 feed. You can leave a response, or trackback from your own site.